Today, I slept late. A little later than I meant to. But, when I woke up, it was perfect timing to get ready and head down to the training academy to pick up my “Arrest Breast Cancer Unlock The Cure” pink sheriff technical t-shirts and my pink 5-point badge (both of which I get to wear to work all of next month for breast cancer awareness month!!!). While I was there, I talked to the lady who is in charge of putting things and events together for the Team Sheriff groups. I had talked to her about potential future shirt designs for the running group. I mentioned something to her today about maybe doing headbands too. She said for me to email her, so later in the day I did. I included a link to Bondi Band’s website, specifically to their “custom” page so she could take a look at what they have. She emailed me back and asked my opinion on what we should get on the bands. I said that either a red band with “team sheriff” in bold caps across it or a black band with our 5-color shoulder patch on it. I’m excited! I hope she decides to do headbands and I hope enough people get on board and agree to buy one…or two! While at the shirt/badge pick up, I grabbed 2 sausage wraps. The sheriff’s bbq team was there grilling up sausage and chicken parts. On the way home, I grabbed a caramel frosty shake from Wendy’s. Then, I stopped into my apartment complex and committed to 13 more months with them…so I’m theirs thru the end of November 2014. Then I settled in for a couple hours of WoW. Around 4:30 I decided that I wanted Italian food for dinner, but that if I wanted it, I had better go right then and there if I was going to do an 8 mile run at sundown. So, I went to Olive Garden. I ordered one of their specials…the steak gorgonzola alfredo pasta and then had a slice of pumpkin cheesecake. I drank about/at least a half-gallon of unsweet tea. So, I get home and I’m letting my food settle while I browse the internet for about 45 minutes. 7:30 hits and I start getting things ready for my run. My usual hand bottle full of Gatorade with a serving of energy beans tucked in the zip pocket. My water fuel belt with one bottle of Gatorade and one bottle of plain water (to go with the beans). I strapped my headlamp around my head and out the door I went. It wasn’t dark yet. I get to the front of the complex and turn on my Garmin and do my leg swings and calf raises to warm up my hips and calves. And then I’m off! And I’m cruisin’! A lot faster than I thought I would be, too. For the first half mile I was cruisin’ around 9:30 min/mile! By the time I hit the 1 mile mark I was going 10:11. Nice. But I’ve got 7 more miles to go, better not burn myself out! I was sooooo full. I was burping pumpkin cheesecake for the first mile or so. I was so full of food and tea that I couldn’t even think of taking sips of my Gatorade until over 2.5 miles into the run. By the time I got back home, I had about half or more of my handheld bottle still full of Gatorade, so none of the fluids on my fuel belt got touched and I for sure didn’t eat the energy beans I took with me. I would say that about 2/3 of my route was lighted to some degree. The other 1/3 wasn’t lighted at all and was pitch dark, or close to it. And my headlamp worked wonderfully. I had no near misses with traffic this time. When I got back to my apartment, I felt the best I’ve felt immediately post-run in quite a while. I mean, I ALWAYS feel good/great after a run, but I truly felt great after tonight’s run. I think it had to do with the fact that there was zero hot sun beating down on me for the whole run. And I'm really happy with my time on the last mile being almost a full minute faster than the mile before it! Now THAT's a negative split!!! Funny thing about tonight’s run…when I loaded my Garmin info onto the computer, for the weather report it gives, it showed a cloud with rain coming out of the bottom of it. There wasn’t a single cloud in the sky, let alone any rain. I have no idea what my Garmin was thinking. But, I think it tracked my calories accurately…903 for 8 miles. Sounds good to me. 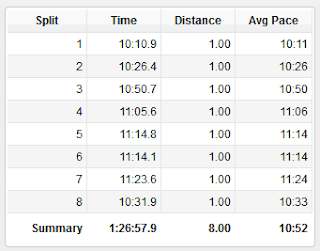 Oh, and I did the 8 miles in good time too: 1 hour 26 minutes. I think my fastest 8 miles is 2 minutes faster than that. So I was really cruisin’ tonight. Like I said, I felt GOOD tonight.